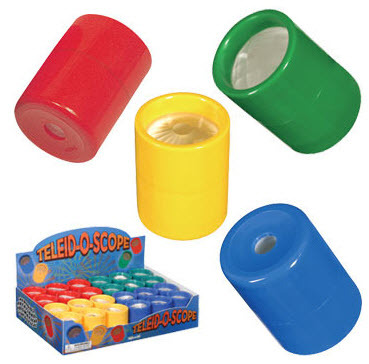 These 2 inch teleidoscopes come in four colors; each color has 3 different lens style options. Hold to your eye and rotate the base to see the kaleidoscope effects. Made by Toysmith. NOTE: AT THIS TIME, All yellow styles are out of stock. Want to request a certain color? Please choose a color when checking out. We will do our best to fulfill your request based on our stock levels. Colors are not guaranteed.